We had a laid back sort of holiday weekend this year for Fourth of July, which is rather unusual for us this time of year. I'm not complaining really, as I tend to be the one in the family who doesn't like to fill the agenda too full. Thursday wasn't really the weekend, but it should be noted that it was the first time that we dealt with a question regarding a figure of speech. These conversations tend to me some of my favorite with little kids, because they take things so very literal. This is especially true of Brayden, who is not only taking things literally these days, but is also very black and white. Things spoken are true as gold, and are taken as such. So when we pulled into the Walmart parking lot and I exclaimed "man, everyone and their dog is here today! 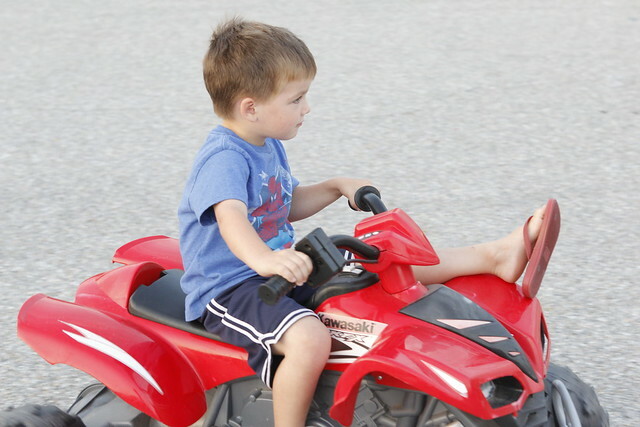 ", Brayden indeed thought that we would be greeted by everyone and their dog. In his five year old mind, Walmart was about to get a lot more fun. Unfortunately for him, not even a service dog was seen, which led to the inevitable "Mom, where are everyone's dogs?" question. To which, I had to stifle my laughter and explain what figures of speech were, and how adults use them to describe things, places and events. I just have to say again, how greatly I love this age/stage. Don't get me wrong, we do have our moments (OH SWEET MERCY THE ATTITUDES! ), but, the conversations alone are worth the small battles. Connor kills me. 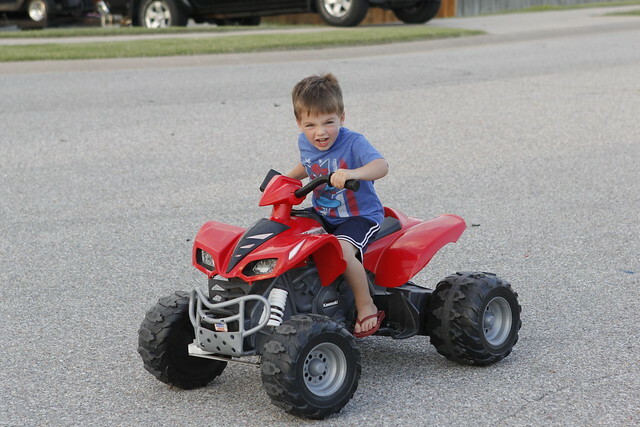 I caught him driving the four wheeler around with his left foot up like this. Sometimes he's just too much! The Fourth was spent with neighbors, who graciously offer up the use of the pools and like to hang out with our whole family. We really have been blessed with great neighbors. We were fed like kings, and then given a fireworks show that wowed the boys. 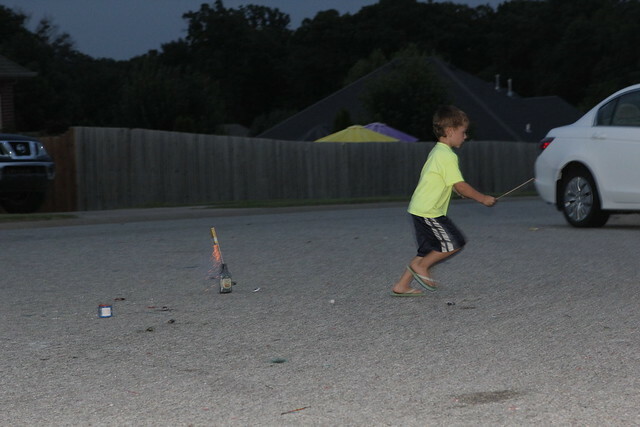 Both boys got to actually light fireworks themselves too. I fear we have two pyrotechnics in the making. 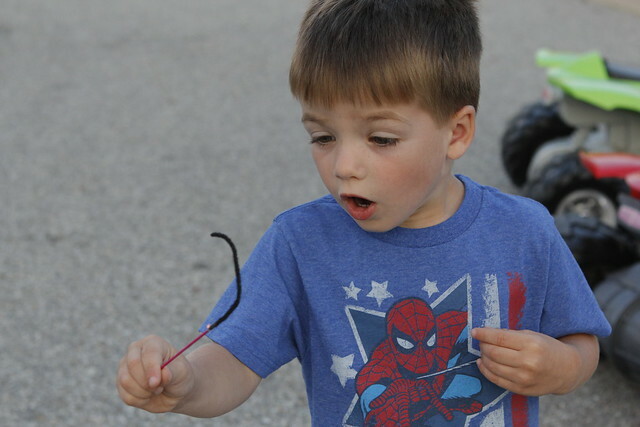 Brayden kept trying to light the loose grass on fire with his sparklers, and Connor carelessly flung hot ash off of his sparkler after getting a bit too dramatic (imagine that!) 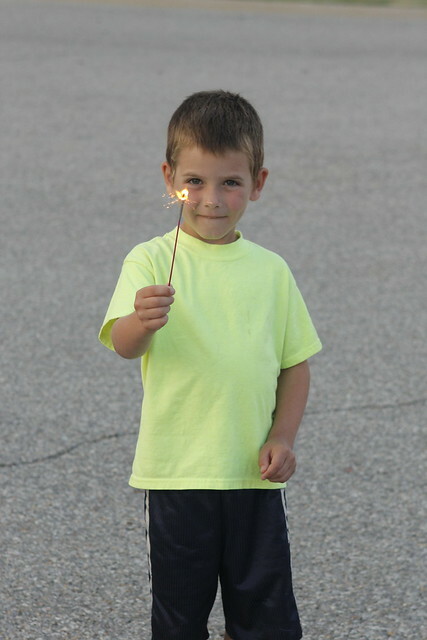 with his sparkler swirling. run run run as fast as you can. 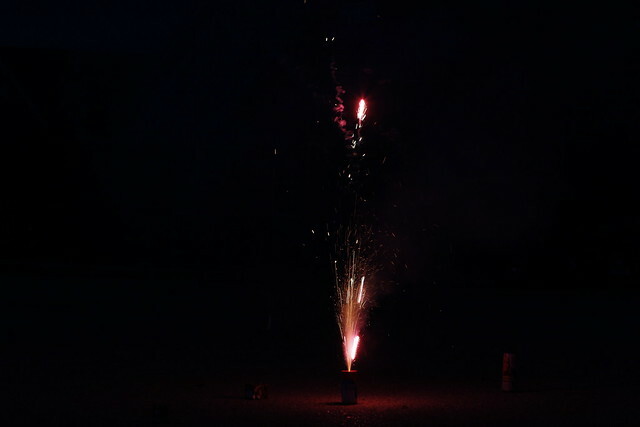 Away from the fireworks, they're super hot, man! 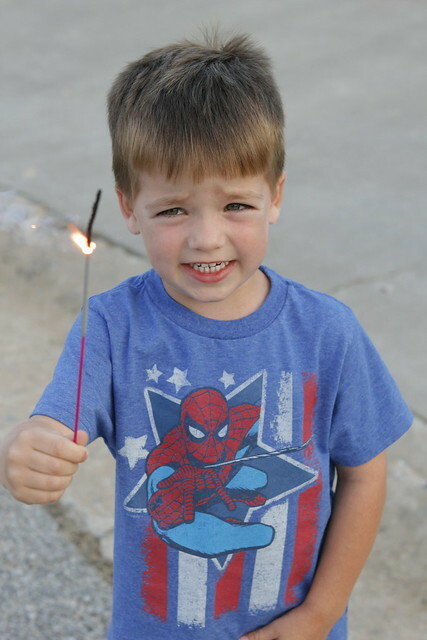 this was Connors candid reaction when the sparkler finished burning. Every time I look at this picture I laugh! Saturday we went to a little birthday party for our friend, Paige. 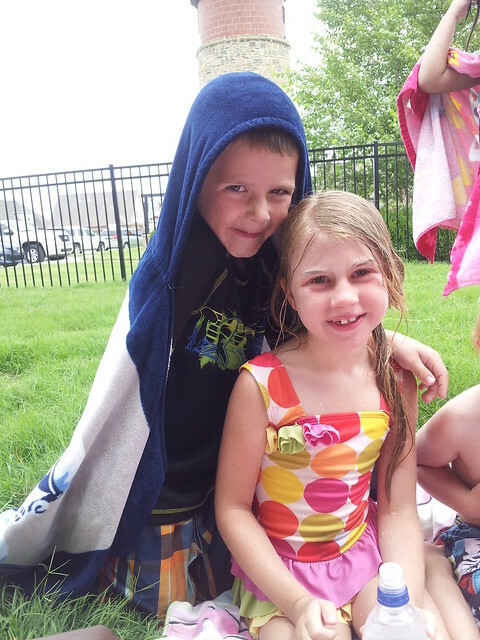 My friend Katie and I are secretly arranging Brayden and Paige's wedding. And Tyler keeps me on my toes. 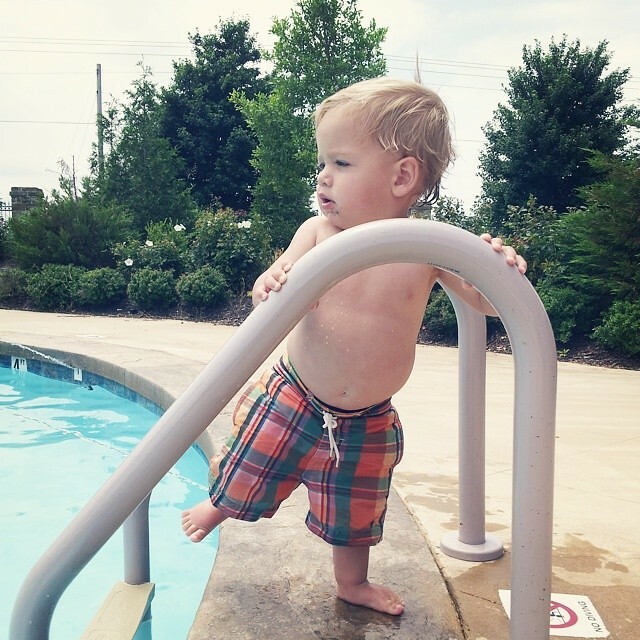 He has not even one ounce of fear when it comes to the pool, and thought that swimming in the deep end seemed like so much more fun than playing in the zero entry part of the pool. After the party, Drew took the older boys camping. This was Connor's first time to camp, and aside from a rough 2 hour drive (Drew regretted not heeding my advice on taking the DVD player ;) ), the boys did well. Tyler and I enjoyed some one on one time. It's funny, the third child kind of just goes with the flow and although he's not overlooked, sometimes he just gets bunched in with the rest of us. When he's alone, his personality really shines. He is HILARIOUS (and tries to be!) and is super vocal. He talked the baby jibber jabber the entire day Saturday and most of the day Sunday. I love seeing how he is becoming his own little person. This is what Tyler likes to do when brothers are gone (well, honestly, he does it all the time). 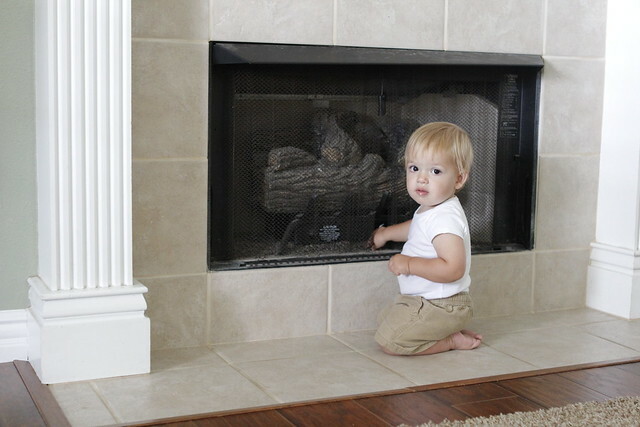 Problem with it when the brothers are gone is there's no one to scream across the house to let me know he's trying to sneak rocks out of the fireplace. Caught him red handed. We're in for a fun-filled month of July, as pretty much every weekend is booked with fun summer activities with friends. I'm excited and soaking up every minute we have together, as fall looks to be more crazy than ever with two kids in extra-curricular activities this year. And even though I'm dreading the amount of time we'll be in the van driving to practices and games, Drew was pretty much dead on when he said "well, it'll be crazy, but this is what we wanted." And he's right. It'll be crazy, but it will be my crazy. My perfect crazy. So here's to the remainder of summer... and the crazies to follow!